While people gathered in Boston hoping that Attorney General Jeff Sessions would talk about DACA, he did not comment publicly on immigration after talking to law enforcement about the MS-13 gang. 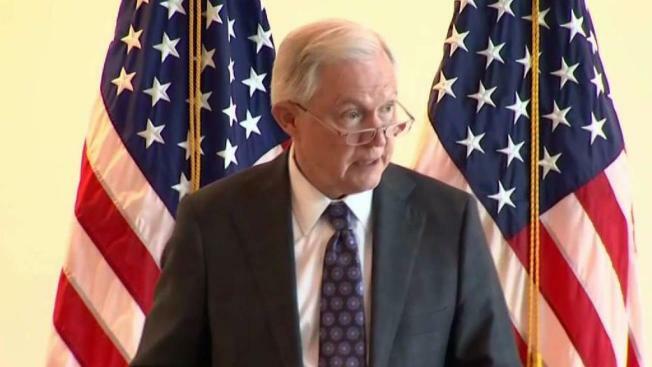 Attorney General Jeff Sessions took aim at the violent transnational MS-13 gang while addressing law enforcement officials in Boston on Thursday. "MS-13 is probably the most violent and ruthless gangs on the streets today. It has made inflicting gruesome violence their primary feature," Sessions said. While Sessions detailed the challenges of curtailing MS-13, he commended the local law officials' effort. "I understand that over 400 federal, state, and local law enforcement officers took part in the massive MS-13 takedown stemming from this office’s indictment of 60 MS-13 members." AG Jeff Sessions talks to law enforcement officials about transnational organized crime, taking aim at the MS-13 gang. 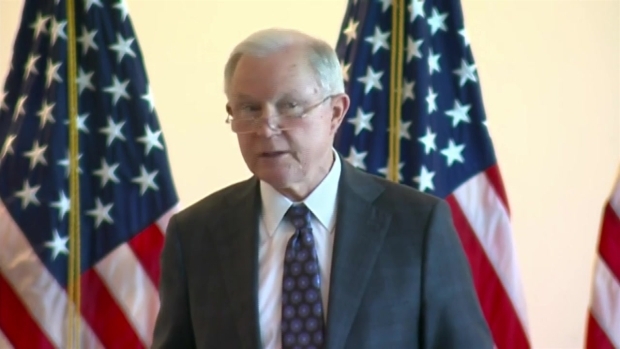 Sessions said the collaboration between local law enforcement and the federal government is critical to stopping MS-13. "You have also made good use of all the implements in the federal tool box: RICO, false documents, alien in possession of a firearm, and conspiracy to distribute narcotics," Sessions said. "This is precisely how we will dismantle and defeat MS-13: charge them with whatever crime they commit and stay nimble and flexible to ensure we get them off of the street, in jail and out of the country." Sessions previously called MS-13 and similar groups "one of the gravest threats to American safety." The MS-13 gang, also called Mara Salvatrucha, started in Los Angeles in the mid-1980s. Authorities say it has more than 30,000 members worldwide and more than 10,000 in the U.S. In July, Sessions traveled to El Salvador on a mission to work with that country's government against MS-13. In a visit to New York earlier this year, he vowed to wipe out the gang altogether. Sessions also spoke in Philadelphia, one the country's biggest sanctuary cities, in July, and discussed how the gang recruits young members from schools. Protesters greeted U.S. Attorney General Jeff Sessions' arrival at the U.S. Attorney's office in Boston prior to his addressing law enforcement officials about transnational organized crime. “The more they recruit, the more damage they do,” Sessions said. He called for everyone "to work together to take MS-13 off the streets." Federal authorities last year charged more than 50 members of the gang in and around Boston with racketeering, drug trafficking and gun charges. 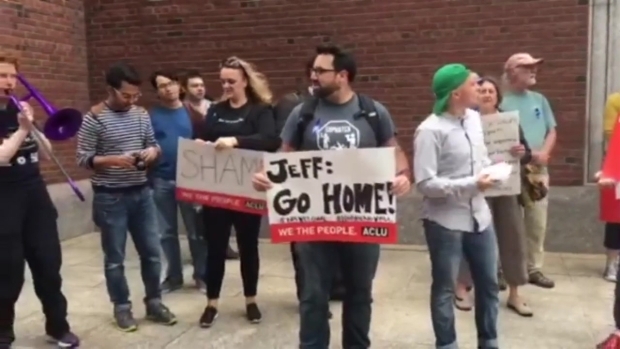 Session's arrival was met by some protesters representing the ACLU, whose signs proclaimed he was not welcome in Boston due to his anti-immigration agenda.